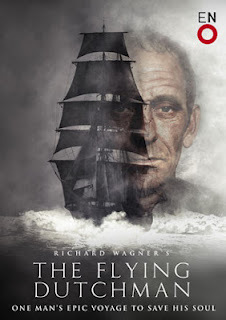 Last night Stu and I went to see an English National Opera production of Wagner's The Flying Dutchman at the London Coliseum. It was a great show directed by hot young thing Jonathan "Sweeney Todd" Kent although the weight of the opera perhaps dragged itself beneath the waves at times. This was by no means the fault of the creatives, Paul Brown's design is glorious, it's just that Wagner can plod at times - "some sublime moments but some terrible half hours." Also Kent had decided that there should be no interval so with all three acts laid end to end there were a few people shifting in their seats for the two and quarter hour stretch. The story tells of a ghost captain, The Dutchman, who having invoked the Devil to save him in a storm is cursed to roam the sea forever without rest. An angel brought to him the terms of his redemption: every seven years the waves will cast him upon the shore; if he can find a wife who will be true to him he will be released from his curse. He happens upon a sea-captain Daland who after seeing The Dutchamn's gold promises him his daughter Senta's hand in marriage. Much of this is viewed by an infant Senta in a dream. When the captains return to dry land enter stage left femme-fatale the real Senta and with boyfriend Erik in tow. Much toing and froing occur and let's just say it doesn't end well.